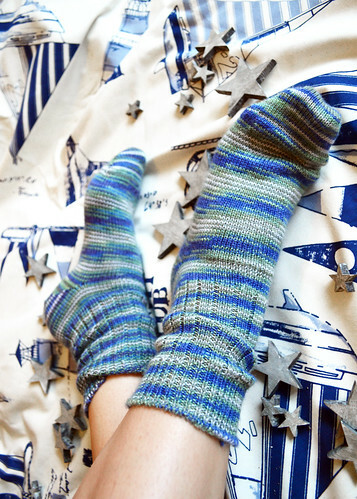 I love fun socks and this makes sock knitting ideally suited for me. Yet, I don’t knit socks yet. Maybe it is just because I’ve been focusing my knitting on baby gifts for so long, but for whatever reason socks have never been on my needles. But has always been in the back of my mind as a wishful thing to do. Then my friend Marseille sent me two pairs of socks she made on her sock knitting machine. Not exactly knit by hand, but certainly not store-bought. Sock machines don’t work like bread baking machines. You don’t just toss the yarn in and out comes a warm pair of socks in the morning, it takes tweaking, settings, and calibration. My attitude changed and the intimidation fell away. If a machine can knit socks, maybe I can to. Once I realized I wanted to knit socks, I went hunting for beautiful free sock patterns. Here is a partial list I compiled. Now, to decide which to knit as my first pair of socks. Have you knit socks? What challenges and pitfalls should I watch out for? Do you have a go-to pattern that I should consider? Oh, and you may recognise the green socks as being knit from my Knitmas 2013 yarn. This entry was posted in Knit Socks & Boot Cuffs, Tutorials | Patterns and tagged free knitting pattern, free knitting patterns, knitmas, Knitting, Marseille, socks.